The peptide immunogen is highly conserved between CaMKII alpha, beta, gamma, and delta. Synthetic peptide within Human CaMKII aa 200-300. The exact sequence is proprietary. WB: Mouse brain, rat brain and human fetal brain tisse lysates. IHC-P: Human hepatocellulas carcinoma tissue. ICC/IF: U87-MG and PC12 cells. Our Abpromise guarantee covers the use of ab52476 in the following tested applications. WB 1/1000 - 1/5000. Detects a band of approximately 45, 70 kDa (predicted molecular weight: 54 kDa). For unpurified use at 1/20000. Observed band size: 45,70 kDa why is the actual band size different from the predicted? Immunohistochemistry (Formalin/PFA-fixed paraffin-embedded sections) analysis of human hepatocellular carcinoma tissue labelling CaMKII with purified ab52476 at 1/500. Heat mediated antigen retrieval was performed using Tris/EDTA buffer pH 9. A prediluted HRP-polymer conjugated anti-rabbit IgG was used as the secondary antibody. Negative control using PBS instead of primary antibody. Counterstained with hematoxylin. Immunocytochemistry/Immunofluorescence analysis of U87-MG cells labelling CaMKII with purified ab52476 at 1/250. Cells were fixed with 4% paraformaldehyde and permeabilized with 0.1% aTriton X-100. An Alexa Fluor® 555-conjugated goat anti-rabbit IgG (1/500) was used as the secondary antibody. DAPI (blue) was used as the nuclear counterstain. Control: primary antibody (1/250) and secondary antibody, ab150113, an Alexa Fluor® 488-conjugated goat anti-mouse IgG (1/500). ICC/IF image of unpurified ab52476 stained PC12 cells. The cells were 4% PFA fixed (10 min) and then incubated in 1% BSA / 10% normal goat serum / 0.3M glycine in 0.1% PBS-Tween for 1h to permeabilise the cells and block non-specific protein-protein interactions. The cells were then incubated with the antibody (ab52476, 1µg/ml) overnight at +4°C. 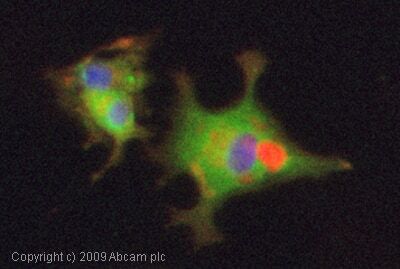 The secondary antibody (green)ÿwas Alexa Fluor® 488 goat anti-rabbit IgG (H+L) used at a 1/1000 dilution for 1h. Alexa Fluor® 594 WGA was used to label plasma membranes (red) at a 1/200 dilution for 1h. DAPI was used to stain the cell nuclei (blue) at a concentration of 1.43µM. Publishing research using ab52476? Please let us know so that we can cite the reference in this datasheet. If this wasn&apos;t the correct antibody to use, would you have any suggestions for what would work well for our application? How is the tissue fixed and prepared before staining? If it is PFA fixed for more than ˜15 minutes, I'd suggest trying an antigen retrieval treatment in pH6 sodium citrate buffer, and a 1:100 dilution of primary antibody. As we have only tested formalin-fixed paraffin-embedded tissue with ab52476, it may not work with other types of tissue unfortunately. If the mouse-on-mouse staining with ab22609 does cause background, you can reduce this with an anti-mouse F(ab) fragment block like ab6668, or by conjugating a fluorophore directly to the primary antibody. We have conjugation kits like ab102884 which can be used for this purpose. Hi, I am just emailing in regards to the CaMKII alpha antibody (ab52476) we ordered a week or two ago. We wanted to stain 40-um mouse brain slices using this antibody along with our DyLight 405 Donkey Anti-Rabbit or Alexa 647 Donkey Anti-Rabbit secondary. We diluted the primary 1:200, 500, 1000 and 2000 but saw no fluorescence/signal across our slices (where we would expect to see fluorescence). Our IHC protocol has worked for many primaries we have used in our lab, and we haven&apos;t come across any issues until now. I just wanted to check to see if we are using this antibody appropriately or if it would work in our situation. If not, is there a replacement antibody you could recommend? Or is it possible that we just received a bad batch? Thank you very much for contacting us and letting us know about the trouble with this antibody. I do have a few questions, so that I can better understand the situation. 1) How is the mouse brain tissue fixed and processed? Ab52476 has only been tested on formalin-fixed and paraffin-embedded tissue, so we are not sure whether it works with cryosections or perfused-fixed tissue. 2) Do you perform any antigen retrieval steps? 3) What kind of blocking solution do you use? 4) We've tested the antibody on paraffin-embedded tissue up to 1:100 dilution (chromogenic detection though). Have you tried higher a higher concentration than 1:200? 5) I've looked through our records and believe I've found your order- could you confirm the order or PO# that this antibody was received on? 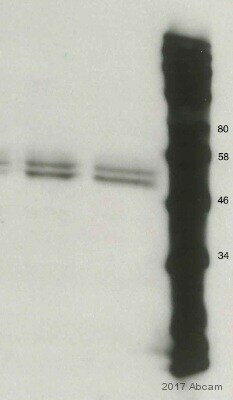 We haven't received any other recent reports of this antibody not working, so I'm not sure that the batch is bad. Even though the protocol has worked well with other primaries in the past, there may be some optimization required in order to see results with this antibody, so once I have the above details I may have some suggestions. I look forward to hearing from you. Please let me know if you have any further questions or if there is anything else that we can do for you, and I'll be happy to help. I am sorry to hear that the antibody is giving problems. As we discussed over the phone,I would suggest adding protease inhibitors to the lysis buffer in order to prevent the lysed proteins to be digested and degraded by proteases. Please let me know if this helps to improve your results. If not, please let me know also your order or PO number, so that we can discuss other options of resolving the issue. I am beginning to gather the CoC's you have requested. When you have a chance, please provide the lot number from each catalog number so I can include this information on the documentation. Thanks for the additional information. Thank you for your enquiry. I can confirm that ab52476 CaMKII antibody [EP1829Y] recognizes all subunits of the protein, since the peptide immunogen is highly conserved between CaMKII-alpha, -beta, -gamma, and -omega. I hope this will be helpful to you. If you have any further questions, please do not hesitate to contact us.